Those were the days. Piston driven airplane engines, unpressurized cabins, in flight food service that consisted of a box lunch tossed at you by a loadmaster, and your luggage not just flying on the same plane, but often flying right next to you on a pallet lashed to the bare aircraft floor. Aaaah, to be a serviceman in the 1960’s headed of for exotic ports of call like Johnston Island, Keflavik, Tripoli or Karachi. All courtesy of the US Air Force’s Military Air Transport Service and the US Air Force Europe’s 322nd Air Division. But hey Soldier, before you board that plane why not get yourself some flight insurance? Who knows when that engine was last overhauled or the hydraulic fluid levels were checked? The responsible thing is to leave Mom & Dad a little pocket money should the unexpected happen. So step over to the Mutual of Omaha insurance desk right here in the MATS terminal and sign up for a few hundred dollars, or even a few thousand dollars of flight insurance. It’ll give you peace of mind and maybe even help the folks pay for that new Oldsmobile they’ve been seeing in the commercials on the Ed Sullivan Show. After WWII the US Air Force recognized the need to maintain the ability to transport personnel to make sure they could get the people and supplies where they were needed, often to places commercial airlines couldn’t or wouldn’t fly. This led to the creation of the Military Air Transport Service (MATS). While MATS operations were severely restricted inside the United States (the commercial airlines didn’t like the idea of competing with Uncle Sam), the Air Force operated regularly scheduled personnel and logistics flights to a wide variety of duty posts as far flung as Thule, Greenland and Dhahran, Saudi Arabia. 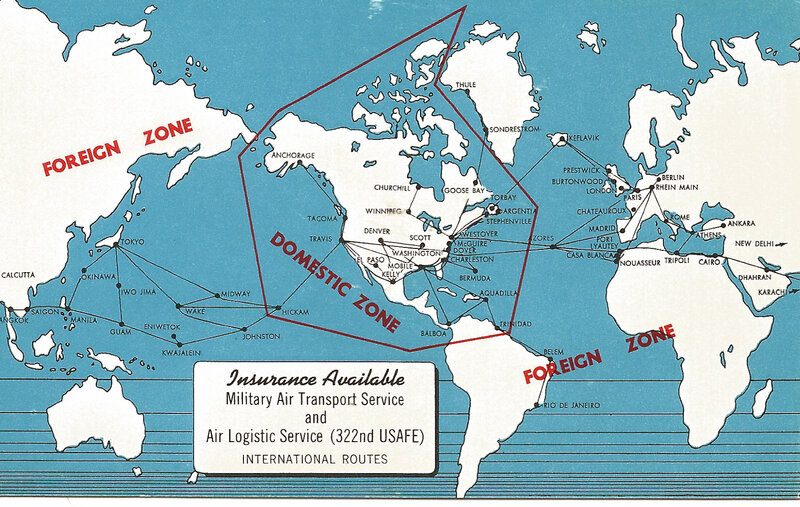 The map on this post card neatly reflects the state of our military commitments in the late 1950’s and early 1960’s. At the time we had a heavy presence in Europe, North Africa and the Middle East. We tied the Pacific basin together with bases on Johnston Island, the Marshall Islands, Iwo Jima, Manila and Saigon. One of the goals of all this activity was to let the Soviets know, in clear terms, that we could move what we wanted, when we wanted, to where we wanted. At the time we were a true global power and everyone knew it. But back to our poor Soldier about to climb aboard that rickety C-54 transport and fly a thousand miles at night to a small spot in the middle of the Atlantic known as the Azores. Suddenly buying a few hundred bucks worth of flight insurance doesn’t seem like such a bad idea. After all, you just never know. Good thing Mutual of Omaha is johnny on the spot with an insurance counter where you fill out your form, slip it and some cash into an envelope and drop it into the collections slot, hoping like hell your folks never see a return on the investment. I’m not sure when this postcard was printed, but I’m guessing the late 1950’s or early 1960’s based on the flights into France (Charles de Gaulle kicked us out in 1967) and the fact that the Military Air Transport Service became the Military Airlift Command in 1966. 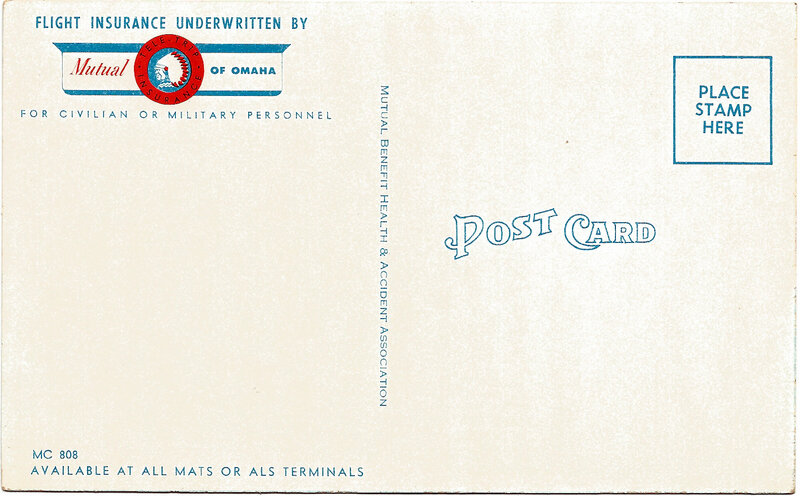 The back of the card shows no marking to indicate the date of printing, but it does helpfully remind us that insurance is available at all MATS or ALS terminals. Just in case our Soldier wants more insurance for the second leg of his trip. Flight insurance was a common offering in airport terminals in those days. As a kid I remember seeing the insurance counters during our infrequent trips to the airport to pick up visiting relatives or say goodbye on those rare occasions when one of our family members flew. Flying was frightfully expensive in those days, and the insurance counters served as a reminder that flight was still something a bit daring and risky. This entry was posted in air force and tagged USAF by Brian Haren. Bookmark the permalink.